The house belonged to Quintus Poppaeus, on of the Poppaeus family to whom Nero’s second wife, Poppaea Sabina, most probably belonged. It extends over 2,000 square metres and reflects the traditional layout of a roman house, with its atrium and peristyle as well as servant quarters and a bath-house. Before admiring the large peristyle it is worth stopping briefly in the atrium, where the lararium is situated in the right-hand corner, and in the room to the left where the walls are frescoed with a triptych inspired by the Trojan war. On the right we can see the death of Laocoon who, along with his children, was strangled by a snake; to the right, Cassandra resist abduction by Odysseus and lastly, in the centre, Cassandra tries to convince the Trojans not to let the wooden horse enter the city. The floor of the living room in the peristyle in the right-hand corner just past the tablinum is of particular interest as it contains a charming mosaic in the centre depicting a scene with pygmies rowing a boat on the river Nile. On the walls decorated with a fourth style green background there are also scenes of Centaurs abducting the Lapithae women. A corridor opening to the right of the peristyle leads to the kitchen, several basement areas and the vegetable garden. In this area was discovered a box containing 118 items of silverware, some gold objects and a few coins. On returning to the peristyle we find the bath-house, whose calidarium still has its original mosaic floor and painted stucco wall decorations. 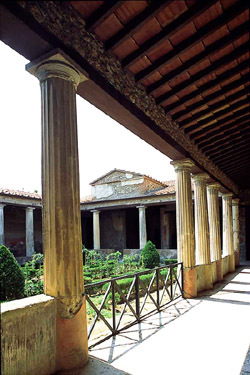 There are four niches at the rear of the peristyle, two of which are rectangular while the others are apsidal. The first one on the right is decorated with second style paintings and has an altar dedicated to the cult of the Lares, which were originally represented by five wooden or wax sculptures from which the plaster casts seen here were made. Next to an apsidal niche there is a rectangular one with an illustration on the right-hand wall of the poet Menander seated. Just before the corner of the peristyle there is a cubiculum which was originally a double bedroom. The position of the mosaic floor would seem to confirm this, even though it has also been suggested that it was used as a storeroom where books were kept on four shelves. Beyond this area we find the part of the house where the servant lived and worked, with cells for the slaves, storeroom for wine and stables. After the main peristyle there is a large triclinium. In the living room which opens out on the right we find the plaster casts of the bodies of twelve treasure-hunting thieves who had come here following the catastrophe of 79 A.D. with the intention of stripping the house of its valuable objects.